I hope everyone had a glamorous, memorable New Year's Eve and happy, not-too-hungover New Year's Day! When I spotted this '80s cocktail dress while Christmas shopping awhile back, I knew it had just enough slightly tacky charm to be perfectly suited for the big night! Tomorrow I go back to work and return to a normal schedule. I'm hoping that means more blog posts! Cheers! The neckline of that dress is fabulous! Cool party dress dear, happy new year! Ohhh this dress is fabulous!! What a great find, so perfect for new years eve! Perfect New Year's Eve dress! I like it. It looks really good on you. 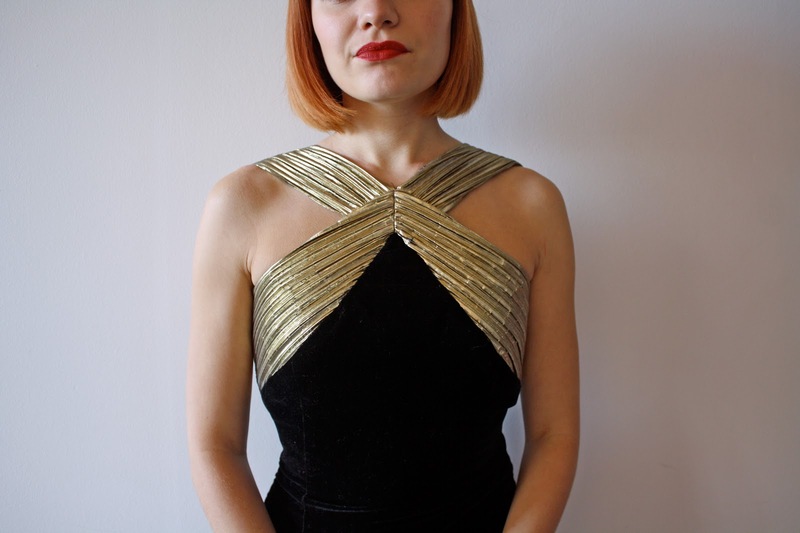 The gold neckline is perfect for NYE! Ohh, what a truly incredible dress! <3 I love love love the gold detail! I love this dress so much! to DIE FOR. Gorgeous dress Katy! You look amazing! oh my word! you look gooooorgeous. You look beautiful in your vintage dress! I would definitely wear one just like that if I had the right occasion. There's just something that I love about 80's party dresses. this dress is absolutely stunning, you look incredible! what a find.